If you’re missing teeth or need to have a tooth removed, the The Smile Factory team will discuss all suitable replacement options with you. Dental implants are viewed as the gold standard when it comes to tooth restoration; they can improve your appearance, the function of your teeth and are an effective long-term solution. A dental implant is a small, titanium post inserted into your jawbone. Once the area heals, a replacement tooth can be put into position. It can restore a single tooth, multiple teeth or support a bridge or denture. Your treatment is carefully planned to ensure your comfort, with surgery carried out next door to our practice. You can receive a temporary tooth if required until the area has fully healed and your permanent solution is placed. Your new teeth will look and function just like natural teeth. Is the process of getting implants painful? No; you will be given anaesthetic prior to the procedure so you will be kept entirely comfortable. When cared for properly, including brushing and flossing regularly and seeing your dentist for regular checkups, dental implants can last a lifetime, making them an outstanding investment. Typically, insurance doesn’t cover implants, but we offer convenient payment plans through DentiCare. 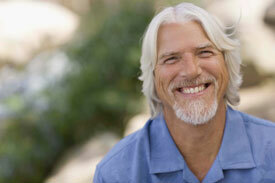 With natural-looking dental implants, you can restore your smile and your self-confidence. Contact us today to schedule a consultation with one of our dentists!